January 21 marked Squirrel Appreciation Day, an occasion meant to recognize squirrels’ importance in nature. It also happens to be the middle of winter, a time when many animals, including some squirrel species, are hibernating. To me, one of the most fascinating winter hibernators is the Richardson’s ground squirrel. 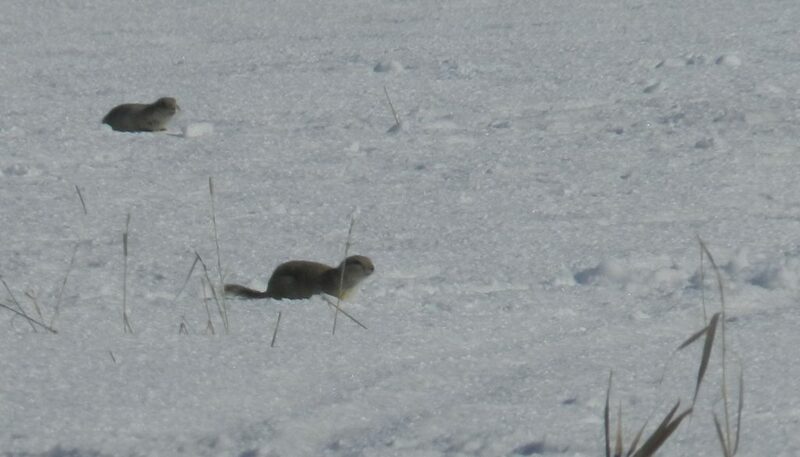 Just 30 centimetres long, this iconic Saskatchewan rodent survives the cold Canadian winters by escaping underground. Depending on the year, some adult Richardson’s ground squirrels hibernate for nine months. Each individual squirrel has its own unique burrow called a hibernaculum, where it disappears for a large part of the year. These squirrels survive by wrapping themselves into tight balls and entering a state of torpor. Torpor is a special state where their body temperature becomes about the same temperature as the surrounding soil of their hibernaculum, as low as 0 C. During torpor, their heart rate and metabolism slow dramatically, allowing them to use hardly any energy. They can’t remain in torpor for the entire winter, though. Every 20 days or so they have to come out of it to rewarm themselves back up to a regular mammalian temperature of approximately 37–40 C before returning again to a torpor state. Torpor allows the squirrels to survive the winter, but it does leave them very vulnerable because they cannot run from or fight predators during this time. To protect themselves, they entirely seal off the entrance of their hibernaculum with dirt. 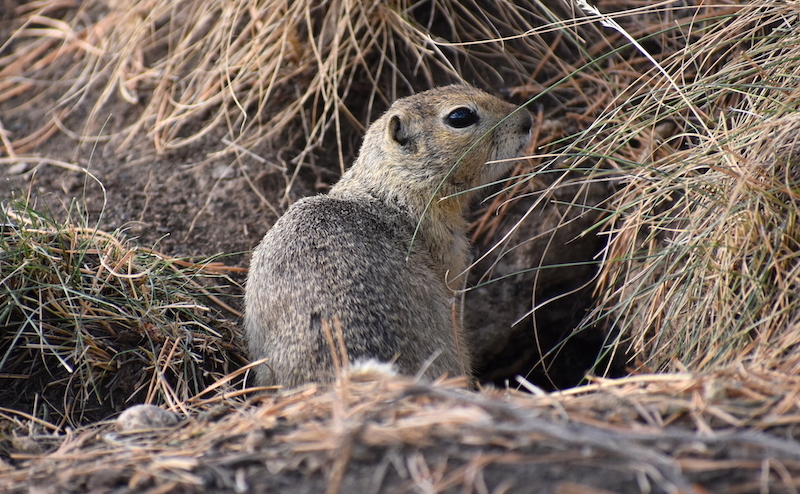 As spring approaches, Richardson’s ground squirrels dig themselves out of their hibernaculum, and the mating season soon starts. Typically, they don’t emerge until the temperature is consistently above freezing, but usually their hibernaculum will still be around 0 C.
As seasonal breeders, squirrels have to mate quickly in the spring. Males typically have a two- to three-week window when they can find a mate, but females are only able to mate for one day a year. 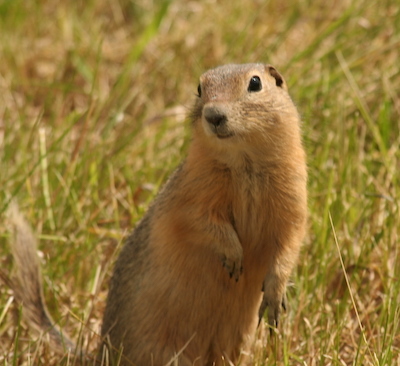 Unlike other rodents, the female Richardson’s ground squirrel has only one litter of five to eight young born in April or May, which she raises by herself. The young stay underground for around a month, with the mother sleeping with the young and visiting the burrow a couple of times a day to nurse the young with milk. Each individual squirrel has its own unique burrow called a hibernaculum. After a month, juvenile squirrels emerge from the den and start to forage for solid food. Less than two months after being born, juvenile squirrels lose their juvenile coat and start bulking up fat reserves to hibernate over the winter. Young females start hibernating as early as August and males begin in October. Juveniles must hibernate for one winter before they can emerge and repeat the cycle by searching for a mate. 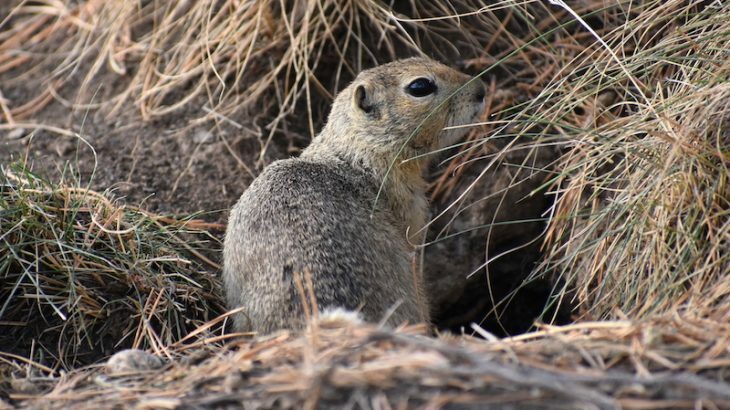 When the spring weather arrives on the prairies, Richardson’s ground squirrels wake up and begin to dig themselves out of their burrows to continue their amazing life cycle. Logan Salm was a 2018 summer communications intern for the Nature Conservancy of Canada in Saskatchewan. This post first appeared on Land Lines, the Nature Conservancy of Canada blog. Biology and Life Sciences, General Science, NCC ground squirrel, hibernation, Logan Salm, Nature Conservancy of Canada, NCC. permalink.